The Rev. 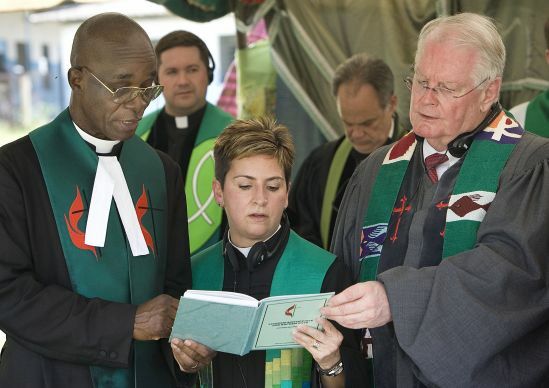 Cynthia Harvey participates in a prayer service in Cote d'Ivoire in 2009. In 1987, Congress designated the month of March that year as Women's History Month. The annual observance continues to this day. In 2013, United Methodist News Service invited several women, both lay and clergy, in The United Methodist Church to share their stories. Here is the response fromBishop Cynthia Fierro Harvey, elected to the episcopacy in 2012 after serving two years as head of the United Methodist Committee on Relief. She serves the Louisiana Episcopal Area. A: I was born on May 5, 1959, in Big Spring, Texas. I was raised in a typical Hispanic neighborhood surrounded by family. My grandparents lived across the street, and my great-aunt and uncle lived next door. I have no memory of ever being with a babysitter but always with family. Being in community is a cornerstone of who I am. I grew up on what some called "the wrong side of the tracks." My parents' home was a very modest home built by my father and grandfather. I remember two bedrooms, one bathroom and five people. It was also the house with the Virgin Mary in the front yard! I am married to Dean Alan Harvey, and our daughter, Elizabeth Grace Harvey, is 22. Q: In what local church did you grow up? A: I was raised in a Roman Catholic household. I am the first non-Catholic in my family. It was not until I went to college that I began attending a United Methodist church — first, Dunwoody United Methodist Church in Georgia, then Foundry United Methodist Church in Houston, which was the church from which I entered ministry. Foundry was the place where I discerned my call. Throughout my high school years, I was active in student government, was a cheerleader and very involved in school activities. I attended The University of Texas at Austin, graduating in 1980 with a degree in journalism. I had a full career in corporate marketing prior to entering full-time ministry. I used to pride myself in having been a layperson longer than (I was) clergy, but (that is no longer the case). My parents both had eighth-grade educations but were the smartest people I have ever known. Q: What are your gifts and how do you share them with the church? The Rev. Cynthia Fierro Harvey plays with a child at the Fairfield orphanage at the Old Mutare Mission in Zimbabwe in this 2007. A UMNS file photo by Bill Norton. A: I have the gift of being able to maintain the balcony view or the long look while maintaining a sense of the here and now. I can lead people to large causes but am also smart enough to know when to follow. I am creative and have a commitment to innovation and stretching or pushing the envelope to see what is possible and not yet seen or discovered. I have always been a curious person, asking many questions. I believe this will serve me well. Q: How do you nurture others, especially girls and women, through the church and in other aspects of your life? A: I pray that I might model for young girls that it is possible to overcome what might be considered impossible. Confidence and certainty about who you are and being comfortable in your own skin is important for young women. Being the best "you" you can be is what I believe God has in mind. In that confidence and certainty, one might discover the very person God is calling. Q: Why is Women's History Month important to you? A: Women's History Month is a time to learn about the women that have gone before us, who have blazed the trails and been true pathfinders of the faith. I know that I stand on the shoulders of giants. Every day, I remind myself that I am just a girl from Big Spring, Texas, called by God to live out a life of faith. I never prayed to become a bishop; I prayed that God would use me as God saw fit. I am simply a faithful and humble servant of God. See more features like this as part of the special series, United Methodist Women Making History. This interview was conducted in 2013 by Barbara Dunlap-Berg, internal content editor for United Methodist Communications, Nashville, Tenn. Contact Dunlap-Berg at (615) 742-5470 ornewsdesk@umcom.org.